Michael Bobbitt, Adventure Theatre artistic director, hosts the seventh episode of Montgomery Arts Infusion on the set of “The Crucible” on stage at Olney Theatre Center. Featured stories include the Paint Branch High School Eclectic Steppers and Art Glass Craftsman Tony Glander. Producer Phyllis Armstrong introduces us to a group of girls who will show us what it takes to be successful steppers. Their hard work gives them the skills to win competitions and their dedication to the art helps them accomplish their life goals. 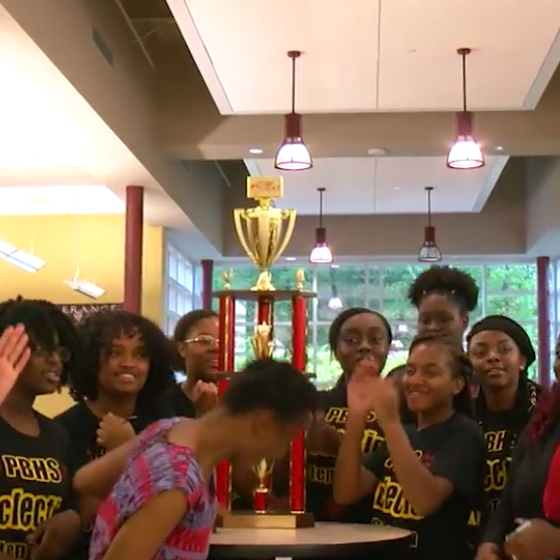 Meet the Paint Branch High School Eclectic Steppers. Producer Nic Rhule takes us along for a view of one Montgomery County craftsman’s art. Tony Glander is a nationally known glass craftsman who creates his art using a variety of unique processes and techniques. As a teacher and an artist he is in demand throughout the states, but he lives in our backyard.